Born in 1977, Rob was educated in Stourbridge and qualified from the University of Wales College of Medicine as a Dental Surgeon in August 2000. After qualifying, he returned to his home town of Stourbridge where he completed his vocational training year. 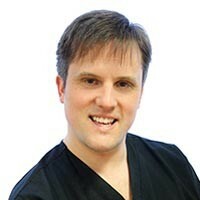 Rob then worked in general practice in the south west of England and in private practice in the Midlands. In September 2004 he gained valuable surgical and medical experience in the Department of Maxillofacial Surgery in the University Hospital of Wales in Cardiff an then as a clinical lecturer at Birmingham Dental hospital. He joined Tupsley Dental practice in 2008 and became a partner in 2010. Rob has obtained his MFGDP from the Royal College of Surgeons and his DPDS from Bristol University. He spent 3 years studying occlusion (the way the teeth, the jaw joint and facial muscles interact) in Leeds, London and Poole. He is developing a special interest in Endodontics (Root fillings) and is currently doing further postgraduate education in this area. Rob has a keen sporting interest. He enjoys kick boxing, water skiing and running. Rob married Kate in 2002, and has two young children, Benjamin and Hermione.